← The A-fraudable Care Act is not too expensive…. A gilded cage, no matter how gilded, fancy or comfortable, is still a cage. 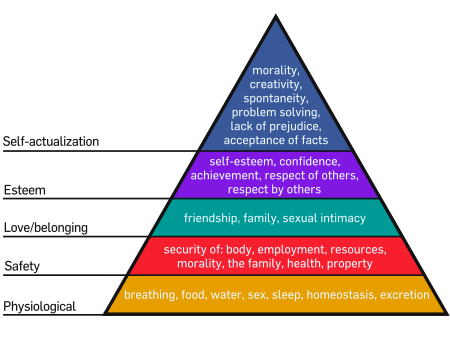 Maslow states that human motivation is based upon a hierarchy of needs from the most basic (food, water, air, sleep) to the highest (self-actualization). The following graphic from Wikipedia is a better visualization than what I could describe in words. Now, I’m not a devious person, but having slept in a Holiday Inn Express a few times and watching the world around me, the way I could control people is to make them dependent upon me. In other words, for a person to eat and have a roof over their heads (i.e., survive), they would have to depend on my generosity. How many movies have been made on such a premise? Last year, during the sequestration and the various political threats being thrown back and forth, the EBT debit system mysteriously went off-line. People who depend (and some who don’t) on these EBT cards for their survival screamed loud and long, in some cases threatening riots unless the problem was fixed immediately. Not surprisingly, the system was fixed within a couple of days, but the message was clear – many people are dependent upon the government for their survival. This is power over the people. The young man then told the professor that is exactly what he sees happening in Canada & the United States. The government keeps pushing us toward Communism/Socialism and keeps spreading the free corn out in the form of programs such as supplemental income, tax credit for unearned income, tax exemptions, tobacco subsidies, dairy subsidies, payments not to plant crops (CRP), welfare, medicine, drugs, etc. while we continually lose our freedoms, just a little at a time. The government is now in the middle of another scheme to control the People, and that scheme is the Affordable Care Act, aka ObamaCare. We all have seen the stories of people losing their coverage, losing their doctors, not being able to afford the new premiums or the deductibles, and the list goes on. ObamaCare isn’t about health or healthcare, it is about controlling yet one more facet of the lives of the citizens of this country. There is no free lunch – someone will have to eventually pay for it. A government big enough to give you everything is also big enough to take everything away. This entry was posted in Conservatism, G.O.P. America, patriotism, Political and tagged Bill of rights, constitution, Declaration of Independence. Bookmark the permalink.